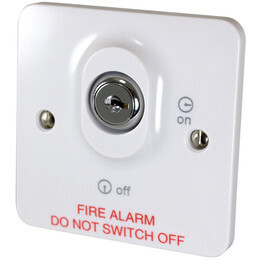 The Fire Alarm Control Panel (FACP) Mains Keyswitch, White, (Part No. BF319) is a lockable, double-pole keyswitch that provides secure switching of the mains supply to a fire alarm panel in accordance with BS 5839-1. It is ideal for use during routine test and maintenance tasks. The BF319 is normally wall mounted and fits to a standard UK 47 mm deep, single gang flush or surface mount back box. Please note, some dry lining & surface boxes may be a tight fit to this switch. It is strongly advisable that the installer check the intended combination of switch and back box. If using a 4 lug flush metal back box, bend the top and bottom lugs out of the way to avoid interference with the back of the switch. Fits on a standard UK 47mm flush or surface mount back box. Supplied with 2 x M3.5 25mm fixing screws. Always read the full installation and operating instructions supplied with the unit before use. Type : Double pole, lockable. 20AX, 250V, 50/60Hz. Connections : L1 and N1 IN; L2 and N2 OUT. Product Dimensions (mm) : 87 W x 87 H x 44 D mm (Can be mounted on a standard UK 47mm single gang flush or surface back box). Construction & Finish : White moulded polycarbonate. Operating Conditions/Temperature : -10ºC to +60ºC.